Inner City Capitol Connections Program Alumni. 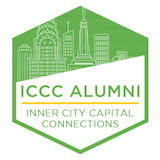 JP Graphics is a proud alumni of the ICCC Program. The program was launched to address the disparities faced by minority-owned and women-owned businesses, enabling these firms to scale and promote job growth in their neighborhoods. Bay Area Green Business — Recyclable. Renewable. Sustainable. At JP Graphics we are concerned about the environment. We are certified a Bay Area Green Business. We have a strong recycling story – we recycle all our waste paper, plates, packaging, ink, spent cartridges, and e-waste. We use vegetable-based ink and many of our papers are recycled and include post-consumer waste. We can provide stock that is completely recycled on request. JP Graphics is certified Woman Owned by the Supplier Clearing House. When your requirements call for this important certification, we deliver! Visit the State of California Supplier Diversity website. Choose Print was launched in January 2011 as an educational campaign to promote the effectiveness and environmental credentials of print on paper. Choose Print’s message is simple and consistent. Print is a recyclable, renewable and, sustainable environmental resource. And, contrary to popular belief, the use of print actually helps promote forests. Print is also a strong driver of both on-line and off-line sales. Print is the tangible, intimate, sensual and trustworthy element of many successful marketing campaigns. Visual Media Alliance (VMA) is a nonprofit trade associations dedicated to providing a variety of benefits and money saving programs to creative, web media, marketing and print businesses in Northern and Central California and Northern Nevada. It provides personal and professional development programs for both owners and employees in the form of business-centric education including management seminars and classes, webinars, conferences, and hands-on technical training. JP Graphics is also a member of Printing Industries of America (PIA), the world’s largest graphic arts trade association, representing an industry with more than 1.2 million employees and serving the interests of more than 12,000 member companies. The Advertising Specialty Institute, or ASI, has been providing award-winning products and services to the advertising specialty and promotional products industry for over 50 years. Promotional products are practical, entertaining, or decorative products imprinted with an advertiser’s name, logo, slogan, or message and given away. Next time you are in need of promotional items like mugs, mouse pads, bags, T-shirts and more, think JP Graphics. 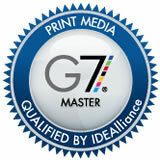 G7 Master status is granted to physical facilities qualified to use the G7 Proof-to-Print Process and uses the most modern technology, techniques, and press controls to produce a close visual match from proof to print.